What were you doing for work when the GFC hit? I was working for The Perth Mint in the investment side of the business. Investment interest in gold was good, but nothing special. The GFC was a step-change, bringing in people who had never looked at gold before. As the crisis developed, each piece of news triggered another bunch of investors to buy gold. I saw it as each person had a different limit to how much bad news they could accumulate before they "freaked out", begun questioning conventional investments and advisor assurances, and consider the unconventional - gold. Despite the fact I’d had the majority of my personal wealth in gold, silver and precious metal miners since 2003, I was still working in a ‘conventional’ finance role, and was heading up the performance and risk team for Cazenove Capital Management in the United Kingdom. The GFC was quite the experience for me as a professional, as there was a huge increase in the amount of requests from clients and our fund managers trying to understand how exposed our portfolios were. Whilst everyone I worked with in the funds management industry, as well as friends and family, knew I was a gold bull, and were wondering how/if they should go and invest in bullion to protect their wealth. What are your clearest memories of the time? A story from the Mint's retail counter where a lady had withdrawn all of her bank account in cash - $160,000 worth - and went to the Mint to buy physical gold. I realised Australia was experiencing the start of a bank run - there was no government guarantee on bank deposits at the time. This 2010 article indicates this lady was not the exception, and the government had to act, with Treasury Secretary Ken Henry quoted as saying: "after the collapse of Lehman, I came to the view there was no financial institution in Australia that could not be regarded as systemically significant". I’ve got a few memories that stand out in particular. The office I worked in was on Moorgate in the city, and there was a Northern Rock office on that street. I remember vividly a gorgeous sunny morning on my way to work when I noticed this huge line up of people down the street. They were all Northern Rock customers waiting for the bank to open. That was really surreal. The other thing I remember is just how badly the AUD got smacked in 2008. For most of the time I worked in the UK, the AUD was rallying, but over a couple of weeks or so, the GBP appreciated from 2.10 to 2.60 versus the AUD. It would have been a great time to be an owner of gold in Australia, and served as a good opportunity for Aussies working in the UK to send some money home. Did gold react the way you expected it too? 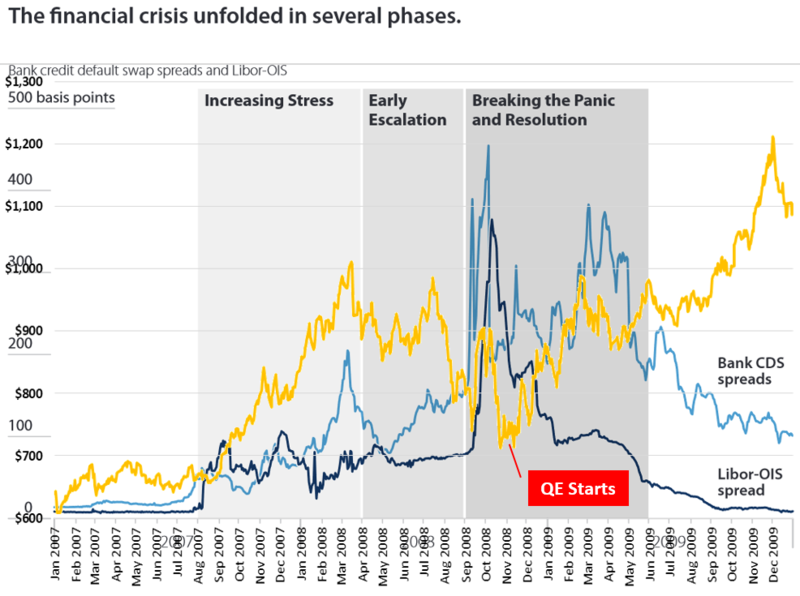 Initially gold did respond, rising from $700 to $1000 during the initial phase but as the chart right shows, which overlays gold against a Yale School of Management phases of financial crisis, gold fell as governments responded with various liquidity programs and other support. However, gold got a second wind when Quantitative Easing started, as this stoked concerns that QE meant money printing and inflation. More or less. Gold performed very well prior to the GFC hitting, but it actually only ended up about 3 or 4% for calendar year 2008 in USD terms, and had quite a meaningful pull back mid year, as investors who were most likely desperate for liquidity, sold it to cover losses in other parts of their portfolios. Gold miners were also hit very heavily during this period, which reinforced to me why they should be seen as a very different investment to physical gold itself. To find out more about the GFC era, come along to the Precious Metal Investment Symposium in Perth next week, 3-4 October 2018, where Jordan and Bron will be on a panel looking back at that era, the lessons learned, and whether or not investors should be worried about another crash.